'Bibi trembles from the hareidim and has succumbed to them,' charges Tzipi Livni after Netanyahu dumps her Conversion Bill. MKs have been left sizzling over the fact that Prime Minister Binyamin Netanyahu (Likud) appears to be negotiating with the hareidi parties currently in the opposition, Yediot Aharonot reports Tuesday. The government struck down a controversial conversion bill over the past 48 hours, leading to an uproar from all sides of the political spectrum and speculation that elections may be near. "Bibi trembles from the hareidim and has succumbed to them," Justice Minister Tzipi Livni (Hatnua) fired. "It would be more honorable if he just allowed us the dignity to go to a vote." Opposition leader MK Yitzhak Herzog (Labor) agreed. "As citizens of Israel are crushed by the costs of living and housing, Netanyahu is only busy with personal survival," he said. "No political maneuver can hide the failures of the Prime Minister in the socioeconomic and political arenas." "The Israeli public are not suckers, and is not in Netanyahu's pocket like he believes," he added. The comments surface after Netanyahu called for a series of personal meetings with each minister, and after over two weeks without an official Cabinet meeting. These are being interpreted by some as preparation for a possible decision by Livni to leave the government. 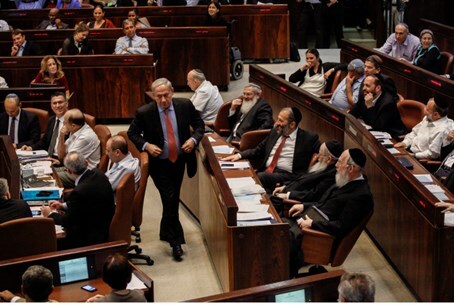 The Prime Minister's Office has said in response that the Knesset, which is currently on break, is merely readying itself to return in November, but some MKs are cynical - and convinced that major issues are behind the sudden move. MK Eliezer Stern (Hatnua), who sponsored the Conversion Bill, was predictably angry. "Unfortunately, the Prime Minister has never meant what he said, and is very far from any notion of integrity," Stern fired. "All he cares about is political survival, but now it is being done at the expense of Israel's future, and in this case the future of the Jewish state." The nationalist camp, meanwhile, has largely welcomed the decision to shelve the conversion law, but warns that the stakes are high. "The risk the Prime Minister is taking is high, and it is in his hands now that the law has not moved beyond the Knesset plenum," Jewish Home faction Chairman Ayelet Shaked stated Tuesday. "The government's decision is more correct than the law." MK Yoni Chetboun of Jewish Home similarly lauded the Prime Minister over the decision. "I applaud the prime minister for showing national responsibility," Chetboun said. "This is a brave decision, that prefers the unity of the Jewish people over the unity of the coalition." "Some things are beyond the narrow political considerations of coalitional makeup. Privatization of the conversion procedure is a danger that looms over the unity of Israel, and stopping it is a national mission,” he added. The bill would allow the rabbi of any city to open a beit din, or religious court for conversion – thus ending the Chief Rabbinate's control of the conversion mechanism. The Jewish Home demands – along with the Chief Rabbis – that only a rabbi who is recognized as being capable of acting as a dayan (religious court judge) or one who has been approved for performing conversion by the Chief Rabbinate will be able to open a beit din for conversion. But the issue has been seen as the "last straw" in a series of recent decisions by the Prime Minister to overturn or halt other popular bills to pass through the Knesset, including the 0% VAT law for young couples seeking to buy their first home. The bill favors buyers who have done either military or national civilian service, thus leaving out most hareidim. "It is not an issue of conversions, the story is housing," hareidi Shas Party Chairman Aryeh Deri stated Tuesday. He says Israel's deepening housing crisis is really the cause of the crisis. "The government, since its establishment, has not done anything to give a chance to young couples to buy an apartment, and every day this affects the welfare of hundreds of thousands of civilians," Deri said. "When citizens lose their jobs, the government doesn't lift a finger to help them," he added. "We should establish a real socialist government, which stops spewing slogans and starts actively helping its citizens."